Once you fall in love with Brussels sprouts, it is impossible to get enough. We eat them like candy at our house, or most of us do. One child has chosen to shun these green meatballs for now- more for us! While we enjoy them shaved in salads and sauteed with garlic, the best preparation in my opinion is to simply toss them in oil, season them with salt and pepper and roast in the oven. 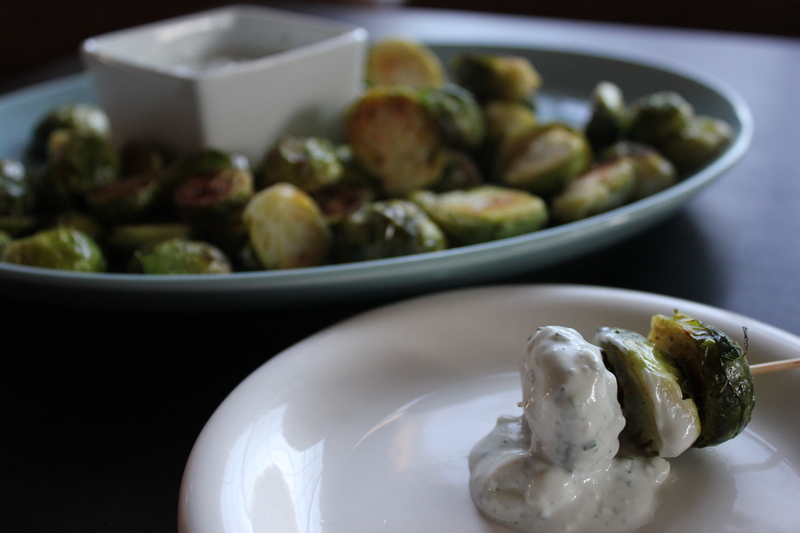 Roasted Brussels Sprouts with Blue Cheese Dip can be served as either an unexpected appetizer or a gratifying side dish. 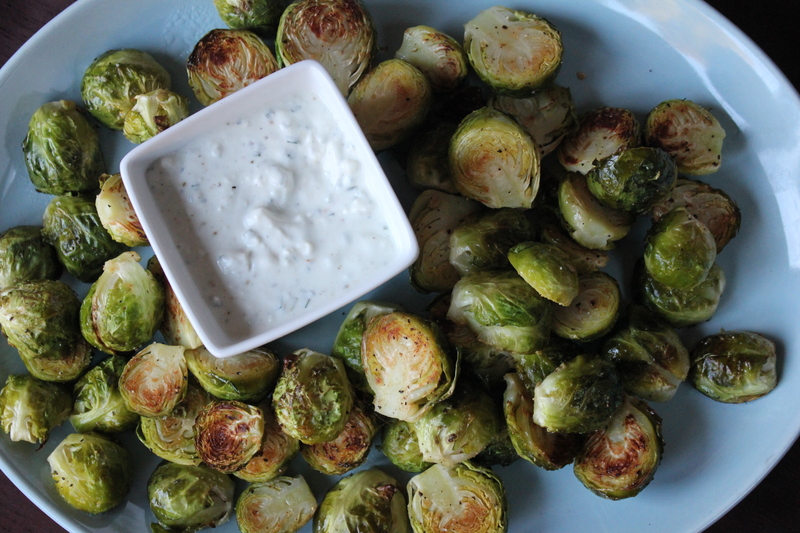 The Brussels sprouts caramelize a bit in the oven and match beautifully with the blue cheese and yogurt dip. The dish hits all the notes of a warm, savory, dippable treat, but without the guilt of fat and carbohydrates that so many appetizers carry. Spring is officially here. Time for fresh potatoes, crisp peas, and tender greens. This dish celebrates them all. 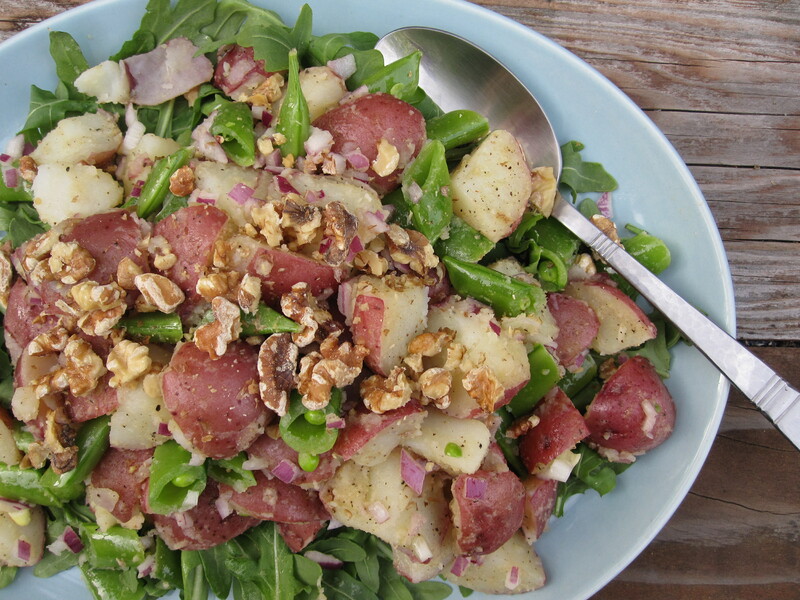 With no resemblance to its more traditional mayo-based cousin, this potato salad is fresh and crisp with a delicate balance between marinated potatoes, plump peas, crunchy toasted walnuts, and peppery arugula. The whole lot is tossed in a simple mustard vinaigrette to make an uncomplicated, appetizing side dish for any spring meal. Sweet potatoes are not very popular at my family Thanksgiving gathering. There are a few of us that enjoy them, but by and large they are passed around the table and politely declined. Even I, a professed yam lover, took years to warm to this tuber. It was not until I had them roasted and unsweetened for the first time that I took a liking to them. I think the added sugar is what gives sweet potatoes a bad name in some circles. If you love those super-sweet marshmallow-covered casseroles, then more power to you, but I cannot stand them. 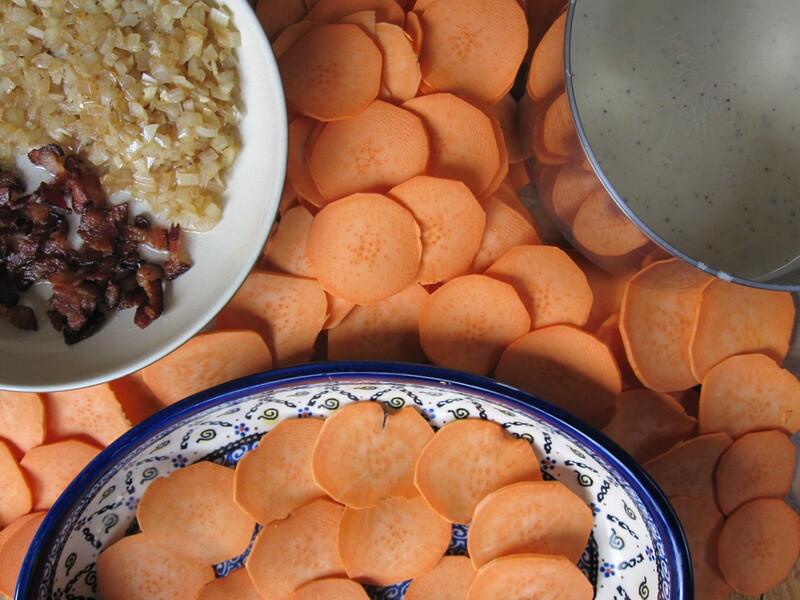 In my opinion, the key to a delicious sweet potato dish is to let the sweetness of the potato itself shine through and season it in a savory way instead. Some dishes seem to create themselves. The ingredients radiate with pure excitement when they enter into each others’ proximity. This was the case when the loads of astonishingly fragrant strawberries pushed into the log of chevre in the fridge the other night. They called to me in their sweet seductive voices to please toss them with fresh spinach and roasted almonds, I was powerless to resist. Luckily, this force is pure good. This dish is full of vibrant seasonal nutritional powerhouses, so the guilt factor is nearly nil. 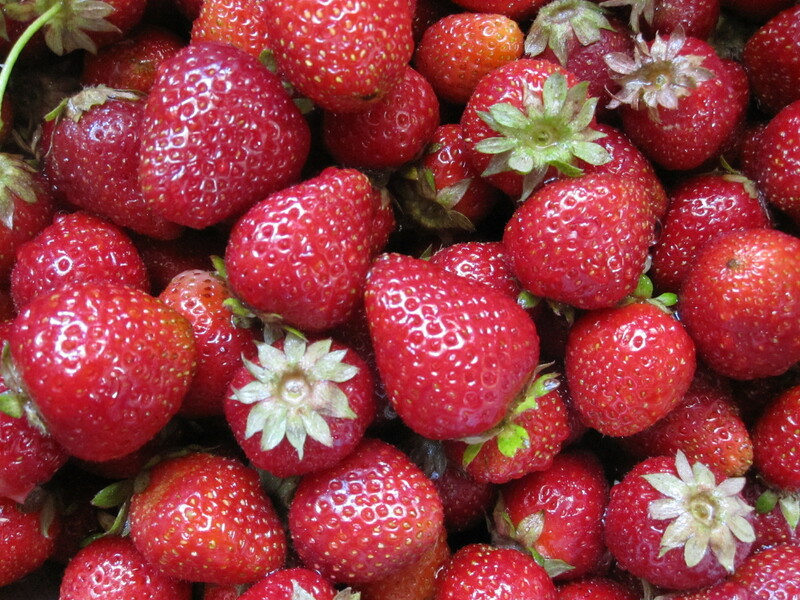 While strawberries are often restricted to dessert or breakfast dishes, they make an excellent salad. Feel free to adapt this at will. 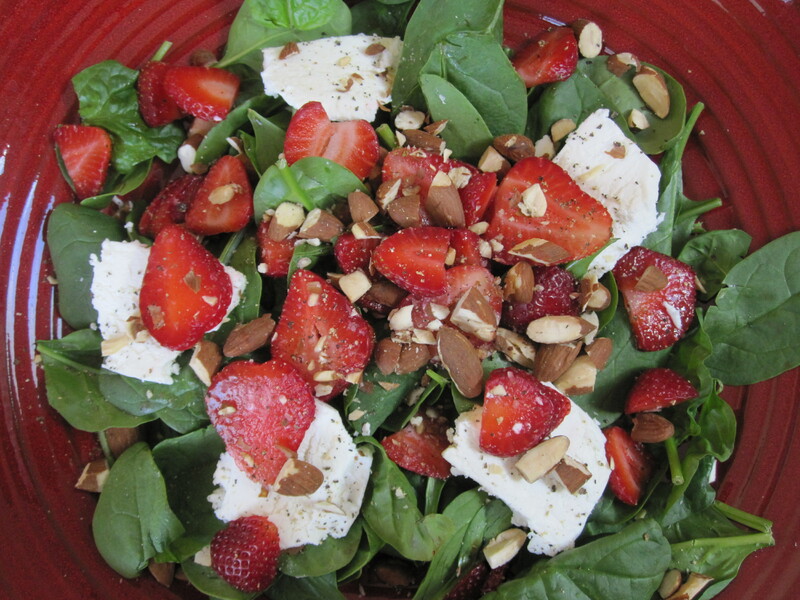 The spinach can be replaced with arugula or butter lettuce, the chevre with feta, and the almonds with walnuts or pinenuts, but do not leave out the STRAWBERRIES! They are too good right now to miss. Adventures come few and far between for me these days. It is not that I am not loving my maternal/ professional/ domestic life, but I do feel the nostalgic for the days when I could take off on a moment’s notice for some incredible journey- usually with twenty bucks in my pocket and only the vaguest of plans. So when my husband’s parents offered to watch our kids for a weekend so we could fly away (Yes, on a plane, with no children!) for a friend’s wedding, we jumped at the opportunity. We filled the weekend with all sorts of adult outings and completely refrained from anything even hinting at a whine. It was fabulous. The wedding itself was special in just about every way. I was especially smitten with the food. Every dish served was beautiful and inspired. 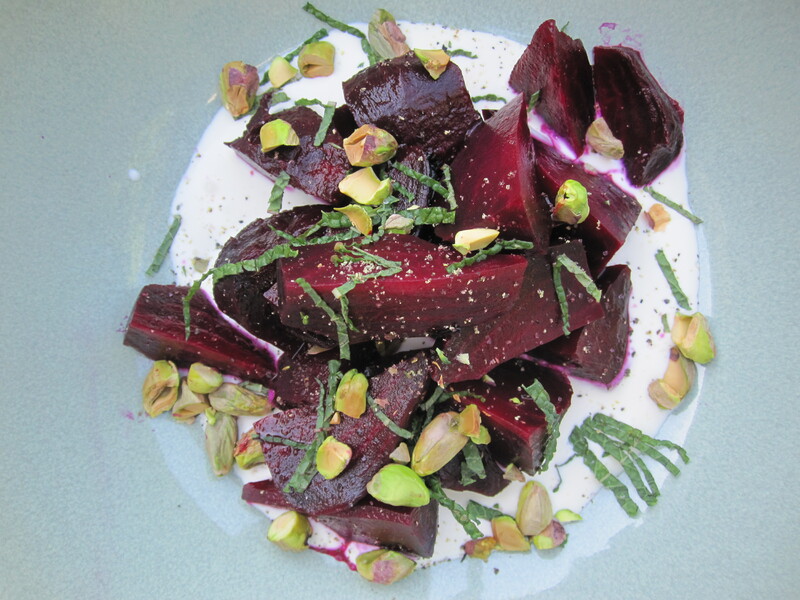 One dish in particular though, struck me with its intriguing taste and unique presentation, the beet salad. Our garden harvest is in a bit of a lull these days. The profusion of kale and broccoli that feed us through the winter is done. While artichokes are beginning to grace our table, the peas and fresh greens of spring have not quite matured. The herbs however, jubilant in the rain-chasing sun, are thriving! We have piles of oregano, mint, parsley, and chives. I love adding combinations of them to just about any dish. 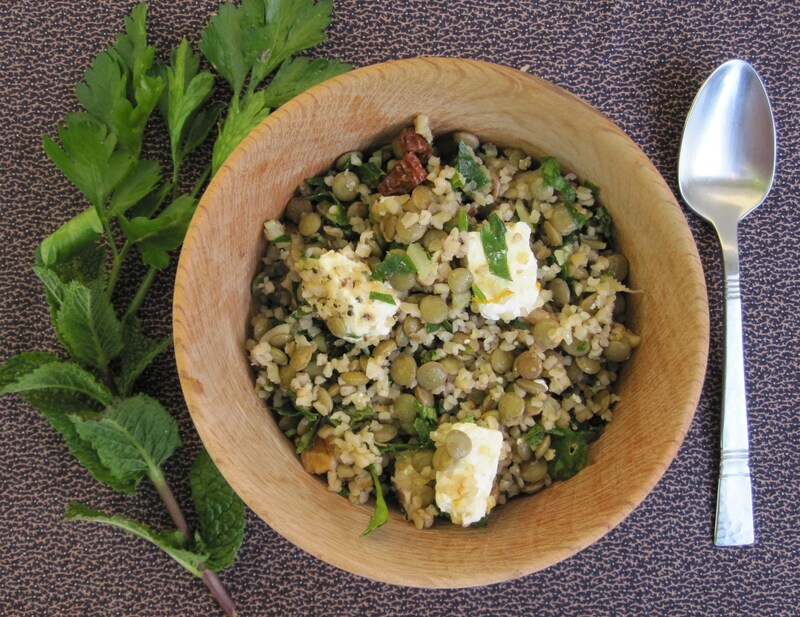 Lentil Bulgur Salad with Feta and Mint is similar to a tabouli, though heartier. The lentils and bulgur combine to form a complete protein. It is incredibly nourishing and satisfying. 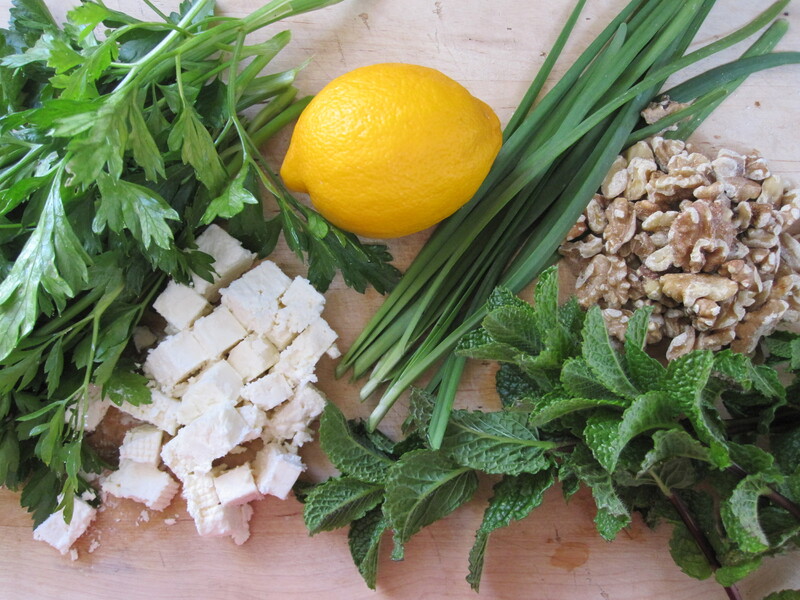 The mint, parsley, and lemon add bright flavors and beautiful color. 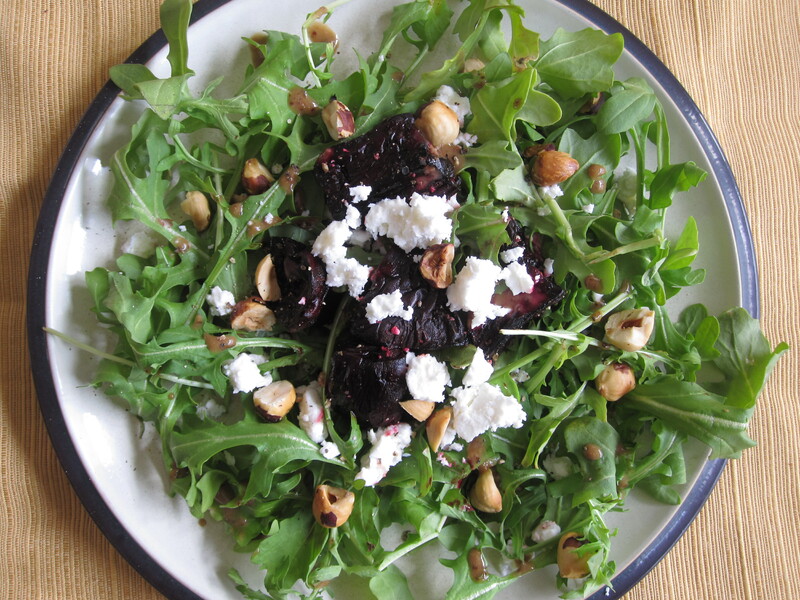 The feta contributes a creamy, tangy element. In summertime, I would make this dish with fresh tomatoes. In springtime, why ruin a perfectly seasonal salad with mediocre tomatoes? I used up some dried tomatoes from last summer, but you could easily skip them altogether as well. 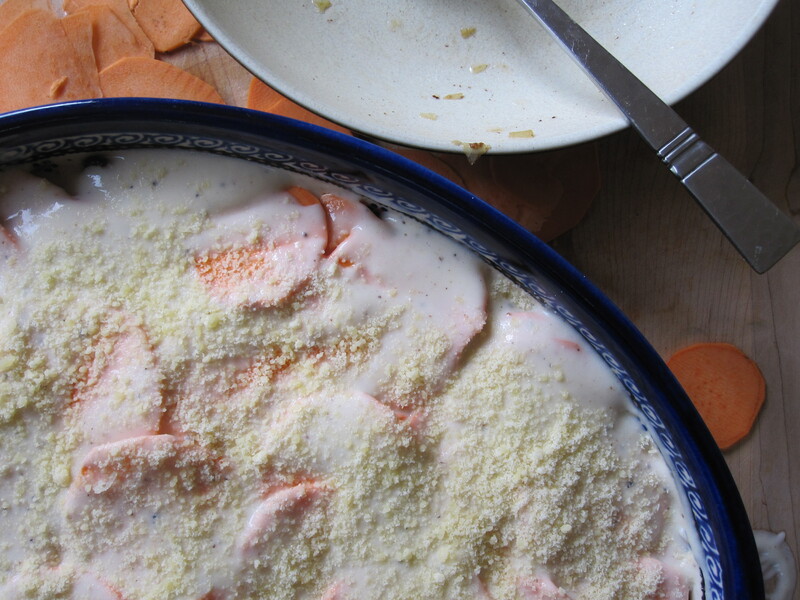 Make this dish ahead for a nice light dinner or bring it along to a picnic or potluck. It travels well. One winter while living in Eugene, Oregon, my roommates and I joined a local farm’s CSA (community-supported agriculture) for the winter. 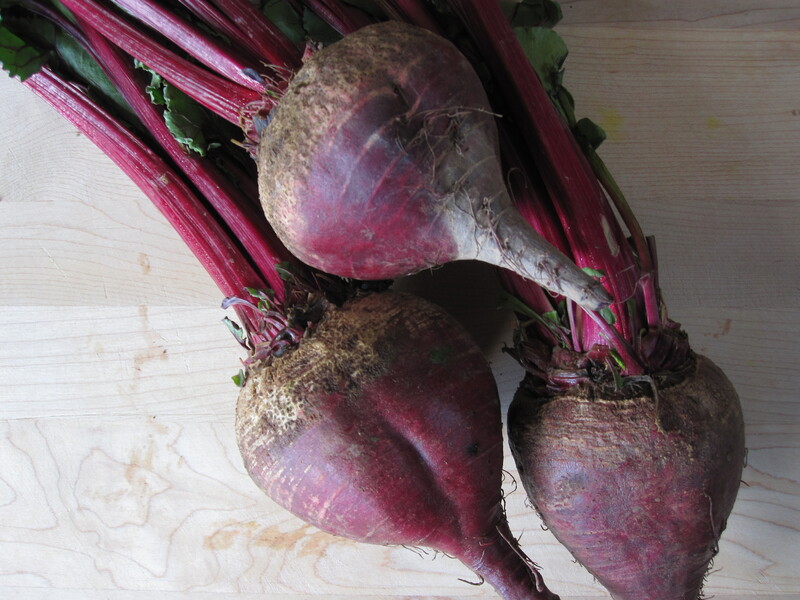 We wanted to support a family that was growing organic vegetables through the winter in the soggy Northwest. As it turned out, that winter was extremely harsh. Most above ground crops froze. Our weekly box from the farm consisted of only vegetables that could be stored in the cellar or the ground.